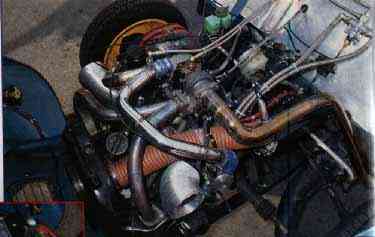 ﻿A Turbo 2CV! The reaction was pretty universal - open mouth/wide eyed, followed by a big grin and then the inevitable question. WHY?? he trouble seems to be that no one takes them too seriously, except the people racing them. 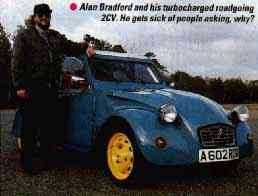 Alan Bradford runs a company called: Kent Citroën and he's now so involved in 2CV racing to the extent that he fancied a really fast road going one. Over a period of three years Alan prepped a new chassis, built a modified body, roll cage, race seats and topped it all off with a turbo conversion running full engine management. The race engine is built to strict regulations using the standard carb and inlet manifold, plus cast iron exhaust manifold, although the system is free. Regulations limit combustion chamber volume, and barrel-to-barrel dimensions are also limited to keep compression down. the standard cam is compulsory and in order to gain a fraction more power a switch is fitted to cut out the alternator. Ignition is standard clockwork and points. Both cars feature full roll cages and lowered suspension. At one time all you could do was lower the race cars, but these days you can cut the front arms and rotate them to reduce the massive castor angles that result from lowering. The suspension is about as basic as it gets. You have a simple swing arm that carries a king pin. Springs operate via a bell-crank directly off the arm onto a canister containing the suspension springs. As the arms move up, the castor angle increases, so lowering by massive amounts results in massive castor. The answer is to cut the arm and rotate the king pin section to regain some sensible castor angle. The Turbo runs roll bars but the racer doesn't. Both have adjustable damper units with the racer being lowered to the regulation limit while the Turbo sits a touch higher to cope with speed ramps ( a pain in the whatsit but a fact of life these days). The Racer runs a standard four speed gearbox and brakes while the Turbo car has a four cylinder Citroën GSA five speeder with GSA brakes. The chassis had to be cut and lengthened a couple of inches to make it all fit, but the cars looks standard from the outside - no bodywork lengthening at all. I have extended the clinic checks to include suspension geometry. Driving at the track I kept wondering if this or that angle might be out, so we measure everything. On the turbo car we did the front wheel alignment only, because the rear wings are a pain to remove in order to fit the alignment clamps. On the racer we did a full four wheel check. Both cars had unequal camber on the front. The racer had almost 1 degree negative on RF with almost no negative at all on the LF. Castor angle was an impressive 10 degrees plus on both cars. Since they were done on the same jig this isn't a surprise. The racer was suffering a bit at the back end. Last race out it picked up another 2CV which hit it on the LR wheel. This had knocked the camber angle to 1 degree negative and punched it in by a degree to give the car rear wheel toe - on one side only. I believe this explains the one-sided handling, but more of that later. On the front of the racer we did a quick check by applying just a fraction of lock - to prove that we had massive camber change due to the big castor angle. A few degrees of lock gave us another degree of negative camber. Looking at the corner weights it's pretty impressive. For a front-wheel-drive car to have such good balance is unusual, plus it's amazing for a four - door saloon to be under 600kg. On the rolling road we already had the figures for the turbo car, since I mapped it on the Emerald rollers earlier that week. To be honest we were all a bit disappointed. the peak torque and peak power were almost at the same rpm and with peak grunt of 61bhp at 5,000rpm, it didn't have either the spread of power, or the low speed torque we were hoping for. It was only when we were able to compare this to the racer that we realised it did have low speed torque, but only by 2CV standards! The racer made 39bhp at similar revs which isn't bad for an almost stock engine. We tried playing with the main jets to no avail, and I dropped a small bell-mouth into one choke ( borrowed from my flow bench) but this did nothing either. In short we couldn't improve on the current set up at all. I opted to try the racer first and went for a run around the outside perimeter track. The gear change takes some getting used to - being a stick exiting from the front of the dash. The exhaust makes all the right noises and it really revs. There is a big drop going into fourth and you lose about 2000rpm. Around the top curve our Fiesta was pulling 110mph but the Citroën felt almost as fast at just over 70mph. Switching out the alternator allowed me to pull another 100rpm ( or was I getting braver?). 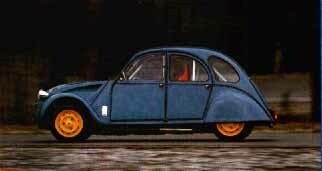 Steering felt safe and predictable and the general driving position said "RACER", rather than 2CV. The boom from the exhaust helps the impression of speed. I was beginning to feel at home. Heading for our favorite corner on the test track I began to build up speed on each run. The handling felt ok. Then I tried harder - the handling felt good. I pushed harder still and the handling felt brilliant. This was serious fun! I was beginning to really enjoy myself because there was almost no body roll and very predictable handling. Finally I found a point where the back end started to make a graunching noise. I reported back but a quick check showed nothing amiss so off I went again. After a dozen runs in the same corner I felt that the car was better on right-hand turns. It wasn't a massive difference, but the balance point where it went from neutral to under steer was smoother on right hand turns - and seemed to be happening later too. On the concentric circles it became apparent that right hand turns did feel better, but I couldn't put my finger on why. I imagined that the weight bias of the driver might be making the difference - not having corner weighted the car at that stage I didn't know it was almost perfect at 49/51% with the driver on board. Switching to left hand turns I soon found the graunching again, accompanied by a bobbing at the back - something wasn't right at the rear end at all. Later we found it was some damage done in a racing shunt the previous weekend (two days before the test). On the concentric circles you can push the car off the edge and as more lock was dialed in, the front end eventually gave up and pushed out. I think the excessive lock was giving us far too much negative camber and so reducing the front end grip to next to nothing. 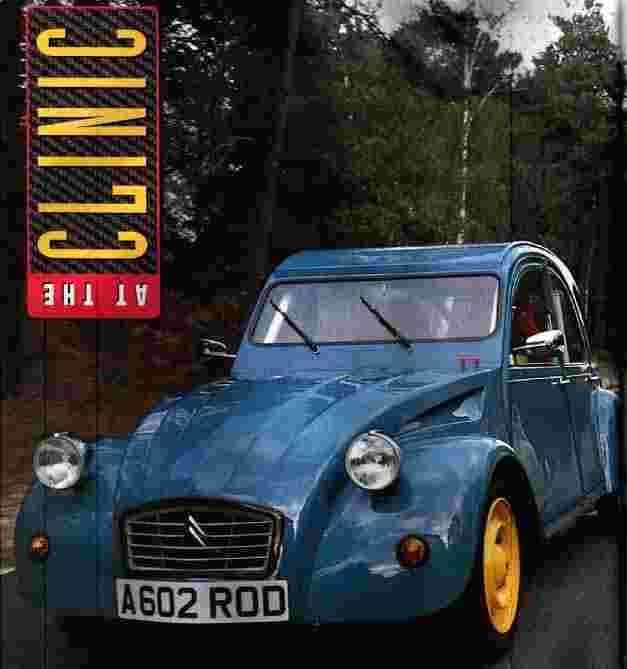 For all that, this 2CV racer was one of the best handling clinic cars to date with a surprising amount of grip from little bicycle type tyres. I really enjoyed it. The Turbo car felt ballistic in a straight line, compared to the racer, although the extra gears didn't give it the edge I thought they would. 80mph came up easily on the outer perimeter circuit and when the two cars were driven side by side the turbo would destroy the racer in a straight power struggle - as you might expect having some 50% more peak power. But the handling was another story. The turbo car had stock springs and my first attempt at a corner produced the legendary 2CV roll that I had previously observed, but never experienced. Initially I was thinking that it was pretty scary and I did frighten myself trying too hard too soon. But as you become accustomed to the roll, it isn't so bad, and by backing off the pace a touch it was predictable enough. Sadly I couldn't explore the handling too far, because of an oil surge problem. Holding any degree of roll resulted in zero oil pressure which seemed to take an age to return. I even stopped the engine a couple of times. rather than bugger the motor, I abandoned the cornering tests. Although the engines look the same, they have different crank cases and where the racer has no oil surge troubles at all, the 650cc motor has a major problem. This is a bit is pretty tricky, but we will tackle the turbo first. Alan is planning a new engine with higher compression ratio to give it a bit more life off boost. The Cam is being junked in favor of a more drastic item to shift power up the rev range and some more mapping is required to sort out the cold starting. On the suspension front, stiffer springs are a must because while the adjustable Spax dampers will control transient handling, the springs control the corner. A compromise between ride comfort and handling will have to be found. These changes will take place along side Alan's next project - a mid engined 2CV using a 160bhp motorcycle engine with 6 speed gearbox !!! This is a lot more difficult. 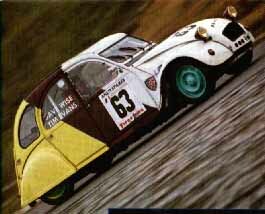 Some serious brains have been applied to 2CV racers over the years and the regulations are tight. Our example was a well developed one, so improvements are not going to be easy. For starters though, that damaged rear wheel needs sorting. We also have different camber settings on the front and I can't honestly say which is the way to go. Currently it looks like you would reduce the negative on the right front to match the left front. But I would like to try and reduce the amount of castor angle. The castor angle adds a lot negative camber on lock so reduced castor might need a little negative in the straight ahead position. My gut feeling is to go for zero negative and reduce the camber angle by half, say to 5 degrees. Reduced castor would give sharper steering and less camber change on lock. A test with tyre temperatures would confirm if it was working or not. Another tweak might be to try and add some positive toe on the rear wheels to try and add some rear end steering effect. It might be a disaster for straight line stability, but you have to try these things. On the engine front I did suggest a few possible avenues, but the boys have to check the regs first to see if they are legal. 2CV's have been buzzing round the tracks for a few years now and there isn't much that hasn't already been tried, or tried and disregarded. In Europe they have a class for prototype 2CV racers where almost anything goes and those cars are topping 120mph with their fuel injected full-race 602cc engines. But then I can't help wondering if the additional expense and speed really add much to the fun factor. 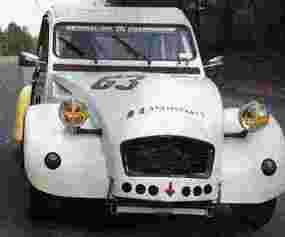 I really enjoyed my brief drive in the 2CV's, Highly recommended for cheap motorsport. What other series gives you free tyres ? ?